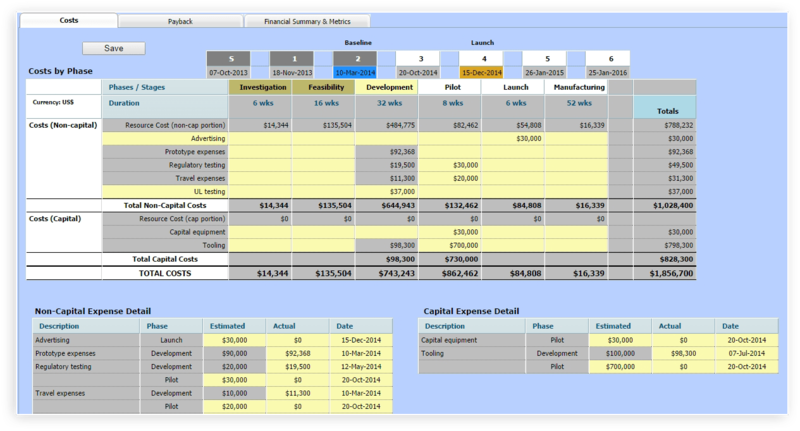 An important part of project management is to plan and manage the project budget and schedule. PD-Trak enables a top-down approach to easily developing a project budget and schedule in the early stages of a project for project proposals and initial planning. As the project progresses past initial phase/stage-gate reviews, more detailed bottom-up project planning is supported. When the project is first created, preliminary schedule estimates provide the basis for the gate dates and phase durations. Similar preliminary estimates are made for resources and project costs. These estimates are refined and updated as the project proceeds through its early phases. Once the “baseline gate” is passed the project team is committed to the targets established for the project and their performance is measured against those targets. Preliminary resource estimates are entered on the Resource Allocation tab by skill set. This data is used to automatically calculate the resource cost allocation to the project on the Costs tab. Only resource types that have been entered into the central resource pool can be costed on the project. These personnel resources are costed based on a cost associated to each resource in a resource pool table. The resource pool captures standard resource cost which is used to calculate the cost contribution to the project based on the headcount numbers or hours entered. Adding other non-capital and capital costs creates a robust baseline cost estimate against which budget changes or actual costs are compared.